What had been a peaceful and productive mission for the six men aboard the Russian space station Mir, including U.S. astronaut Jerry Linenger, nearly became a tragic nightmare during the evening of Feb. 24, 1997. A lithium-perchlorate canister, designed to generate oxygen via a chemical reaction, suddenly burst into flames when activated. Although the fire was quickly subdued, a dense, life-threatening smoke—different in form and movement from its gravity bound counterpart on Earth—rapidly filled the station. Being confined in a limited area 360 kilometers (224 miles) above the nearest fire brigade made the situation even more precarious. "You can't just open a window to ventilate the room," commented cosmonaut Aleksandr Lazutkin in a NASA report about the incident. Fortunately, logical thinking and quick action by the Mir crew limited the fire's impact and prevented any injuries or smoke-related complications from occurring. But the lessons learned that day haven't been forgotten by NASA. Working with the National Institute of Standards and Technology (NIST) since 2002, the space agency has been intensely studying the behavior of smoke in microgravity as the foundation for developing fast, sensitive and reliable methods for detecting it during spaceflight. In a new paper in Fire Safety Journal (FSJ), a team of NASA and NIST researchers describe how they looked at the smoke particles produced by five materials commonly used aboard crewed spacecraft, defined their characteristics and evaluated how well they could be detected by two traditional systems. Because not all of the particles were consistently detected, the researchers recommend that "the next generation of spacecraft fire detectors must be improved and tested against smoke from relevant space materials." Detecting a fire in space requires a very different process than on Earth. 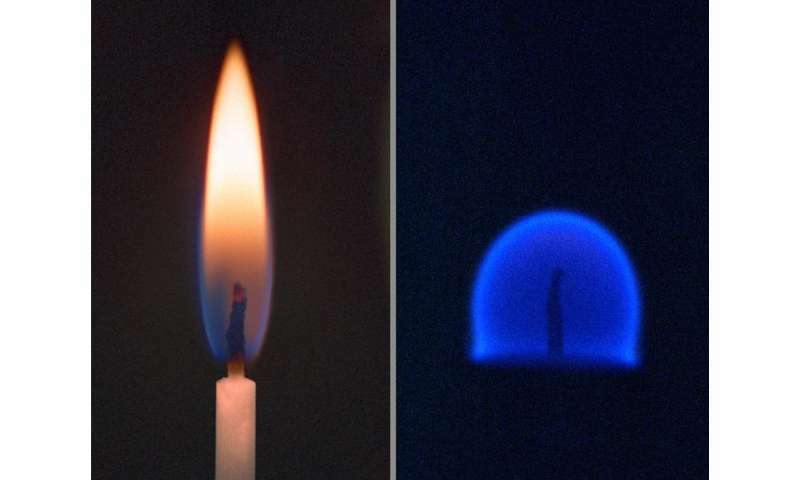 Here, buoyancy—which is dependent on gravity—causes hot gases to rise and makes a flame extend into a long and pointed shape. Smoke particles rise as well, which is why we place detectors on the ceiling. In microgravity, there is no buoyancy, so flames are spherical in shape with the smoke often aggregating into large particles or long chains that spread in all directions. Therefore, smoke detectors on the International Space Station (ISS) and other modern spacecraft are placed within the ventilation system rather than on a compartment wall (There is no "up and down" in a spacecraft to define a ceiling anyway.). Additionally, the materials aboard a spacecraft that might become fuel for a fire are not the same as potential combustibles in terrestrial environments. This means the smoke generated by a fire in microgravity also may have different properties depending on the source, and those traits must be considered when designing effective smoke detectors for crewed vehicles. To scientifically define the characteristics and behavior of smoke particles in space, NASA and NIST conducted the Smoke and Aerosol Measurement Experiment (SAME) aboard the ISS. The findings from this long-term study are discussed in the new FSJ paper. SAME investigated the smoke particles produced by five materials commonly found aboard spacecraft: cellulose, in the form of a cotton lamp wick; Kapton, a polymer used for thermal insulation; silicone rubber, used in seals and gaskets; Teflon, used in insulating wires; and Pyrell, a polyurethane foam used for packing items to survive the forces of launch and re-entry. 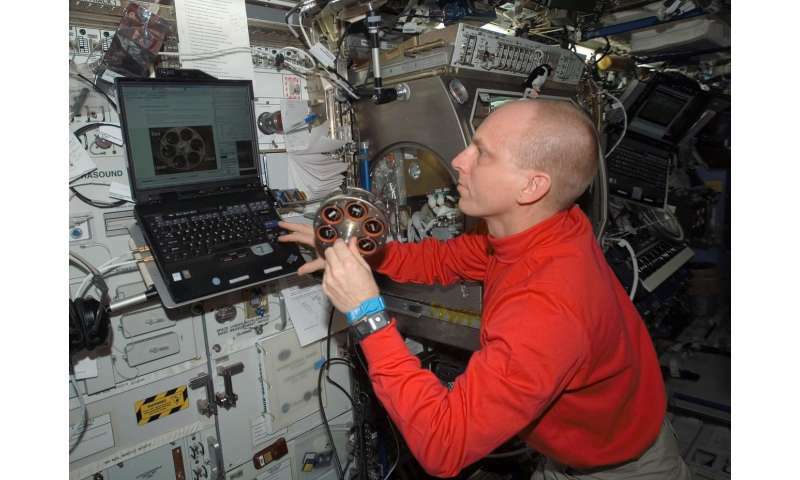 The samples, wrapped in wire filaments, were loaded by an ISS astronaut into a rotatable carousel enclosed within one of the station's gloveboxes. 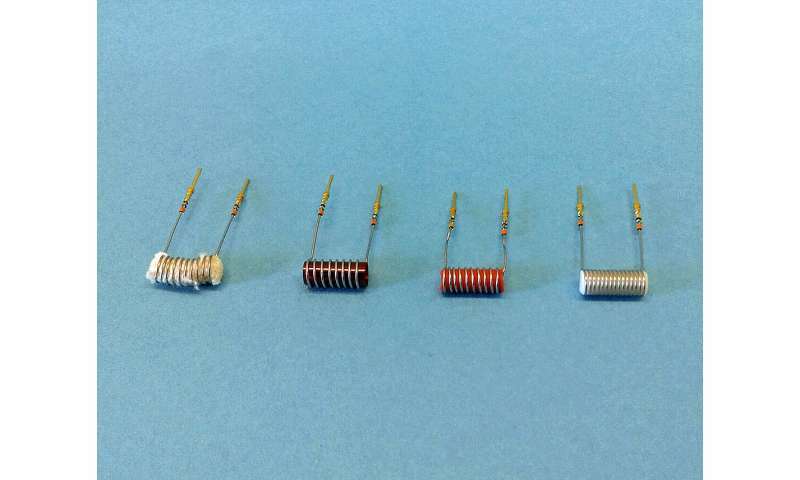 A software program would then apply electrical current to the wires to heat the materials and produce smoke. The smoke was then "aged" in a chamber to simulate the time it would take to build up in a real fire scenario. In each of the SAME runs, the aged smoke was directed to six devices: a sample collector (for electron microscopic analysis on Earth that defined the morphology of the smoke particles), a particle counter, a commercial smoke detector and a mass monitor used to measure particle size, and two different spacecraft smoke detectors, the ionization model used during the space shuttle program and the photoelectric system now aboard the ISS. "By controlling and changing three factors: the rate of sample heating, the airflow passing around the heated material and the age of the smoke generated, we obtained valuable data about smoke from a variety of possible fire conditions," said Tom Cleary, an author on the FSJ paper and the NIST engineer who calibrated the equipment used in SAME. "The large smoke particles produced by overheating the cellulose, silicone and Pyrell samples were easily picked up by the light-scattering photoelectric ISS detector," said Marit Meyer, a research aerospace engineer at the NASA Glenn Research Center in Cleveland, Ohio, and lead author on the FSJ paper. "However, it frequently failed to detect the smaller smoke particles from Teflon and Kapton, a big concern because both materials are extensively used in electronics which is the most likely source of fire and smoke in space." "Considering the wide array of materials and heating conditions possible in a spacecraft fire, as well as the complications from background aerosols in the cabin environment such as dust, we concluded that no single smoke detection method currently available is sensitive enough to detect all possible smoke particle sizes," she said. "More research is needed to better understand how fires behave in microgravity, and in turn, how best to detect them as early as possible by whatever type of smoke they create." Helping provide that knowledge is the goal of the next-level NASA fire study, the Spacecraft Fire Experiment, also known as Saffire. During three tests conducted in 2016 and 2017, unmanned ISS cargo vessels at the end of their missions were turned into orbiting fire laboratories, complete with probes, sensors, cameras and other sophisticated devices. Ground crews remotely ignited the Saffire fuel samples, monitored the progress of the test, and collected the fire data produced. Each experiment fittingly ended with the vehicle burning up in Earth's atmosphere. Three more Saffire burns are scheduled for 2019 and 2020, which also will include smoke particle measurements. As with SAME, NIST's Cleary calibrates all the smoke particle instruments used in the program.